ShadowSea is a new 28mm scale skirmish game from AntiMatter Games. 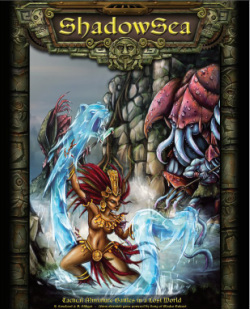 While the entire setting and characters are somewhat original in ShadowSea, the game itself is however powered by Ganesha Games Song of Blades and Heroes ruleset. This isn't a bad thing either, because I'm yet to come across a Song of Blades-driven game I didn't like. The setting is pretty interesting. It sounds a lot like what you'd get it you mixed the tales of El Dorado with the Lost City of Atlantis, blended in with the Land that Time Forgot, and mix in a little bit of Journey to the Center of the Earth for good measure. The entire game takes place underground in what they call a sunless world setting. In this underground ancient world in which they've created there's lush jungles, unforgiving seas, and loads of ruins, just to name a few of the types of places depicted. Some of the action can even take place in undersea environments in ShadowSea. The main factions or sides represented in the game are as follows.. The Axibalan at a glance look a lot like what you'd get if you mixed Aztecs with Amazon women. They're also magic users, so they can be quite formidable. The Dark Mariners is an undersea race. They're made up of slippery shells and flesh, but wield their own form of magic as well. Just looking at the art or miniatures from this race and I get a real thick Chaos vibe too. Visually, I think the Dark Mariners are probably the coolest looking bunch in all of ShadowSea. The Dragonid Legion is clearly the reptilian force in ShadowSea, and it's made up of a variety of different types, and different sizes of reptilian creatures. The Fortune Hunters is the all human race made up from humans from various surface dwelling countries. Driven by greed, all of them are in it for the same reason, which is seeking fortune from the underground world of ShadowSea and nothing more. The Order of Yosoth sounds a lot like the cult-like faction, which dabbles in all things that probably shouldn't be dabbled in. Lastly the Sunless Kingdom is the “all the rest” club, because it's made up of an unlikely variety of different species and creatures like troglodytes, reptilians, insectoids, even giants and trolls. As for the game itself, it's pretty much a port of Song of Blades and Heroes, with some slight differences. They call magic Etheral Magic in ShadowSea, and there's the addition of Technology as well. Most everything is Ether driven in ShadowSea too, which breaks down into three unique types of Ether power Plasma, Electrical and Magnetic. There' also weapons derived from Gunpowder, and BioTech as well, so technically there's five different types of weaponry and technologies to be found within the world of ShadowSea. There's not only magic users, but scientists in ShadowSea as well. Scientists are the only ones who can activate a Tech item, and each faction has a scientist. Scientists can even Salvage Tech items, and also Teach others how to use a Tech item. So it has a steampunky-like vibe to it as well. Like most other SoB games there's pages worth of special abilities to help define the character profiles as well, all of which are quite fitting for the various races and types of characters you'll find in ShadowSea. A nice little variety of different scenarios are also provided like skirmish, ambush, quest, assault, survival and capture, plus how to utilize victory points to carry them over into a campaign setting. 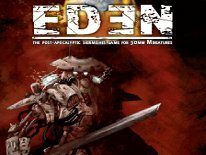 There's rules for the various Artifacts that can be found within the game. Ancient Cities, Lava, Tar Pits, even man eating plants are just a few of the different types of settings that they define with special rules for creating each one. The Undersea environments and the Sunken Citadel are the ones I think that sound the coolest of them all. There's also some rules for adding summoned beings and NPC-like characters. The last section of the rulebook includes profiles for all of the races I mentioned earlier in great detail. In fact they include the rules to create Custom Models as well. So if you don't like what's provided, you can use the simple formula they include to come up with a setup and points cost to play the models you want to play. Being this is an ancient lost world-type setting, I can see how much fun it might be to create your own Indiana Jones, or Laura Croft models to use in ShadowSea. The official models are also pretty neat. Based on what I've seen firsthand, I'd have to say that they're up there with Reaper standards, as some have even been sculpted by industry veterans like Bob Olley, Patrick Keith and Sandra Garrity, but also the creator of ShadowSea himself Eric Luchard sculpted a bunch as well. Cost-wise they're not cheap, but I don't think they're too overpriced either. The biggest models are in the $12-$15 range, while the cheapest smaller models can be found for $4.99-$7.99 each. Most are metal, but many of the larger pieces are resin, and the majority are multi-piece models. I particularly like the Forest Troll and Skullcracker Bird models. They're both all resin, and are multiple parts. The integral bases also have some scenic details on both, and the Forest Troll comes with a 40mm lipped round display base as well to mount it on. The Troglodytes of the Sunless Forest (3 pack) also comes with options. You can opt to use the right arms with hatchets, or the right arm with spears, the choice is yours, but all of the left arms are holding shields. The Lava Lizard is a single piece resin cast model, also with it's own integral scenic base, and lastly Gaston de Lune is a multiple piece all metal model, which also comes with a really nice scenic metal base as well, which comes separate. From what I've seen, it looks like they're headed in the right direction with the model line. Overall I think ShadowSea has great potential. Thes official line of miniatures for ShadowSea is available from Cavalcade Wargames, but the only thing holding the game back at the moment is lack of some more of the official models to play the game with. For instance... While the Axibalan are mostly half naked females, the few males in that tribe are half-man and half-beast-like creatures. However at present they only offer the three bare-breasted female models for that faction. To fill out a force like they have laid out in the rulebook, you'll simply need to do some proxying until they get around to releasing more models. It's a catch 22 I guess, because being new I realize they can't possibly release them all at once, but at the same time if you were to choose the Axibalan as the force that you want to play, your options are extremely limited at the moment. Although I must admit, Reaper has a variety of nice alternative models that I think would work very well too, like many of the Sister's of the Blade models from Reapers Warlord range. Personally I find the Dark Mariners and the Sunless Kingdom models to be the coolest looking so far in the entire line, but in terms of most models currently available that would be The Dark Mariners and Draconid Legion. Both of those sides sport the most options at present in the way of model availability. As for the game itself, if you've played any of the other fantasy-driven Song of Blades and Heroes games, then the basics are pretty much the same. All you need to play are the three different size sticks for measuring movement and ranges, 3x D6 dice to roll for activations, some models, some terrain and a 2ft X 2ft or larger playing surface. What really separates ShadowSea from SoB is the setting, which is essentially a few different unique settings within one. The characters, plus a few rule additions and/or tweaks also help to make it different. So it still has that fast and furious SoB gameplay, because for the most part all you have to remember is your Q (Quality) and C (Combat) stats and refer to a couple of modifier charts depending on what you're attempting to do. On the topic of the rulebook, I think ShadowSea is decorated nicely with lots of imagery to help set the mood, which also gives you a glimpse into what the world of ShadowSea is all about. First and foremost it teaches players the game very well. While it is strictly a black and white affair, it still looks good from cover to cover, but you can't help but wonder how cool it might have looked with more color. I can easily point out a variety of things you could spend $15 on and have a lot less to show for your money too. ShadowSea is probably one of the most far reaching SoB games to date, because it broadens our imagination far more than the average fantasy skirmish game. What I like most is that ShadowSea is not just another medieval town or village, or some mountain top or standard cave setting, it's so much more. The underwater setting and sunken citadel scenarios alone are what I think puts it over the top too.